It was a highlight of the trip. Sure, I don’t remember what songs we sang. I don’t remember much of what the cathedral looked like. I don’t even remember what the brief talk was about. But Archbishop Desmond Tutu was there. And there’s one thing about him I’ll never forget: The spirit of joy he carried himself with. I’m not talking about someone who was just blindly pretending the pain, suffering, and hardships of life don’t exist. A man who walked into the very center of the anti-apartheid movement in South Africa. Someone who embraced the conflict and struggle. One who’s leadership and courage was recognized by the 1984 Nobel Peace Prize. In fact, on the opening day of the Truth and Reconciliation Commission, he was left stunned by the horrible stories people shared. And all he could do was weep. 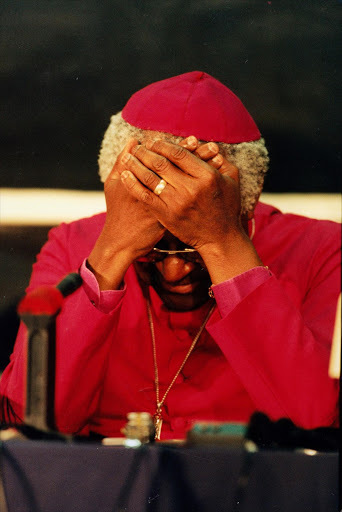 Archbishop Desmond Tutu breaks down during hearings of the Truth and Reconciliation Commission in 1997. This was the man who I saw smiling that Friday morning. Despite all he’d seen, he still chose live with optimism and humor. It’s not just Desmond Tutu who embodies this quality either. I’ve noticed it in almost all of the great leaders and creators I respect… people like my grandfather, Pema Chodron, or Ben Zander. They’re able to laugh at life (and themselves). They step through the world with a sense of play and curiosity. And as a result, not only are their lives better… but they automatically elevate everyone around them too. How Do We Approach Our Work This Way? How do we dance through life with this spirit of play and lightness? How do we live out Rule Number 6? Part of the answer is committing to the foundation. It’s embracing the work of developing who we are… changing the stories that run our lives… redefining our game… and pursuing a vision that’s bigger than we are. However, I’ve also found there are a number of small ways to cultivate this attitude on a daily basis. You can reflect on Rule Number 6 itself. In the heat of the moment, if you can remember it… that alone can help diffuse stress or anxiety. Develop a bigger perspective on life. Meditate on death. Ponder the vastness of space. Realize how against the river of history, our lives are but a small drop. So why not appreciate this moment we’ve been given? Right now. Right here. Do something kind for another person. Seriously, science shows that just being kind can make you feel happier, more alive, and less anxious. To be clear, I’m not saying you should just ignore your problems or pretend they don’t matter. In fact, it’s the opposite. Ultimately, this is about facing your problems more fully. Approaching them with openness and creativity. Being present. And, in the process, uncovering solutions you never would have found otherwise. So that’s my challenge for you… to keep Rule Number 6 in mind this week. Maybe when someone ignores your very, very important email… you don’t have to get annoyed or take it personally. Perhaps when you’re nervous about performing in front of a group… you can take a breath and appreciate the opportunity to be there. Or maybe when you feel stuck in “the grind” of work… you can try to find room for more fun or experimentation. St. George’s was one of the leading churches speaking out against the apartheid. And was nicknamed “The People’s Cathedral” for its strong stance against the injustice. “How fascinating!” I will have to try that during the rest of the year in Nakuru, Kenya. Nakuru is the fourth largest town in Kenya. It is particularly challenging as I drive in a country with no rules for driving with public service vehicles including over 15,000 motorcycle taxis. This year I am really trying to practice giving and receiving grace. I’ll have to add to that saying, “how fascinating!”, the next time and the next time…I drive in and around Nakuru. Haha.